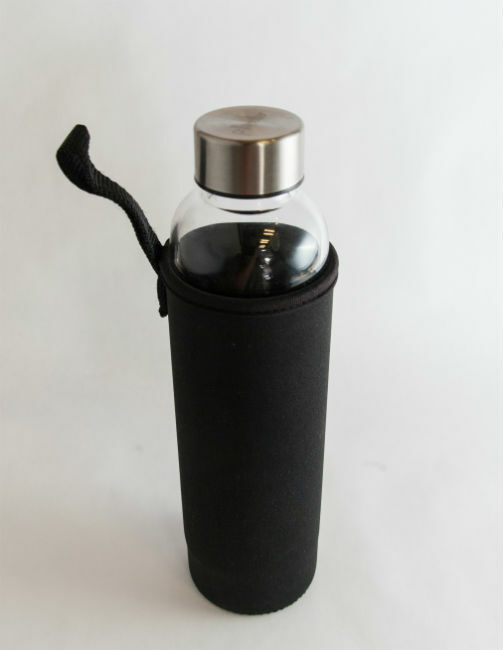 In addition to their regular cold brewer, Primula also makes a Travel Bottle Cold Brew Coffee Maker. I really like this brewer. The travel version is different than the regular version in a few ways. Besides brewing less coffee, the coffee it makes is not a concentrate. Meaning it is ready to drink as soon as the brew completes. Also the travel bottle does everything. 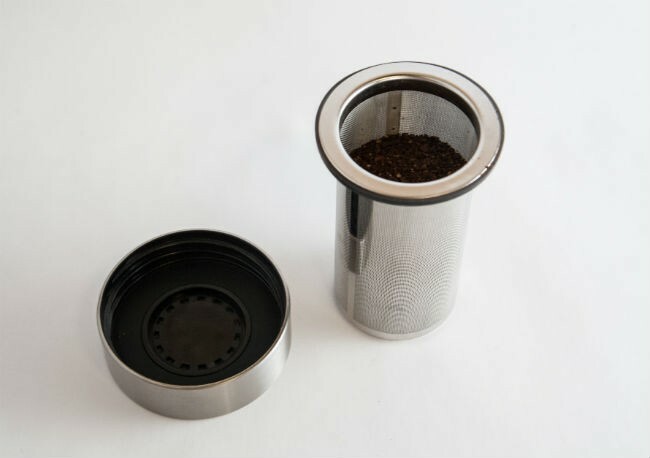 You brew, store, and drink coffee from it. In this tutorial we will make cold brew coffee with the Primula Travel Bottle Cold Brew Coffee Maker. 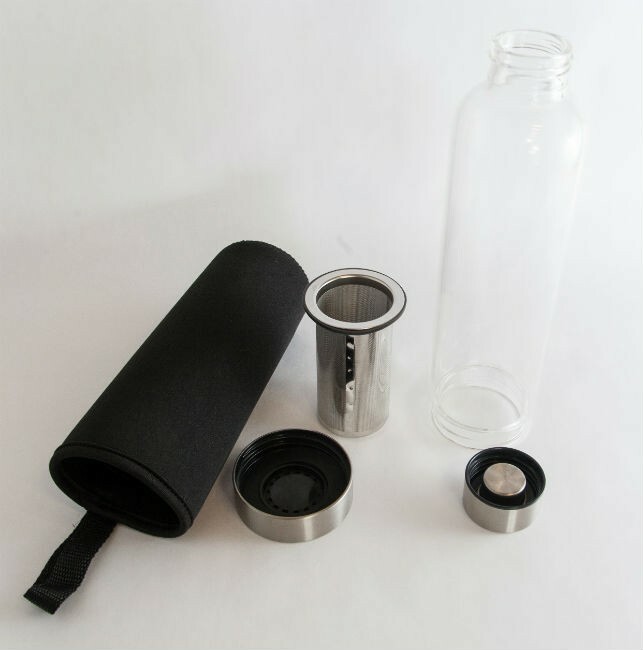 There are five parts to the Primula Travel Bottle Cold Brew Coffee Maker. Neoprene cover to protect and insulate the glass. The top lid for the glass brewer. 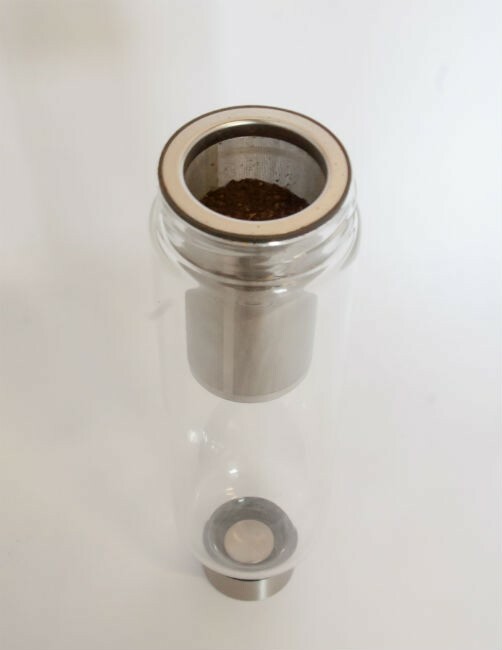 The bottom lid to the glass carafe which holds the coffee filter in place. Add enough medium ground coffee to fill the filter 3/4 of the way full. 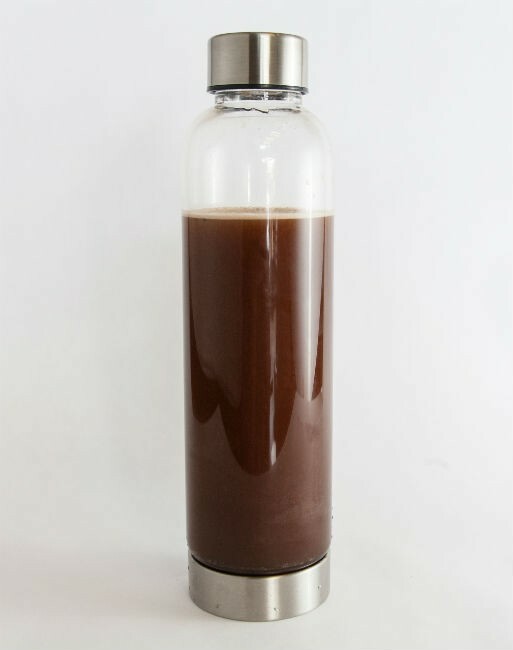 We are using a medium drip grind here as we are using less coffee per ounce of water and we aren’t making a concentrate. Turn the brewer upside down and open the bottom lid. Before placing the filter in the brewer, make sure there are no loose grounds on the rim of the filter. You will want to have a tight seal that does not leak. Place the coffee filter inside. 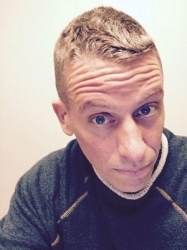 It should look just like the photo below. Secure the bottom lid. This will lock the filter in place for the next step, which involves flipping the travel bottle and filling it with water. Make sure the bottom lid is securely fastened and then fill the travel brewer with cold water. Once full, secure the top lid. At this point you can gently rock the brewer to ensure that water is saturating all the ground coffee. Place the brewer in the refrigerator for at least 12 hours. If it is too weak, you can extend the brew time another 6-12 hours. Do a quick taste test before proceeding to the next step. My best results have been from doing a 24 hour brew and periodically doing a gentle rocking during the brewing. 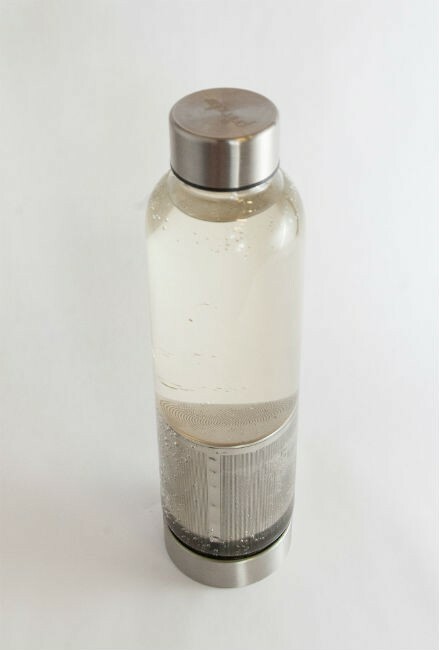 If it is still too weak for your liking, don’t fill the bottle completely full of water. If it ends up being too strong, just add the water back! Make sure the top lid is secure and then flip the brewer upside down. Open the bottom filter and remove the coffee filter. Once the coffee filter is removed, you may see some loose coffee grounds around the edge of the bottle. Take a paper towel and wipe them off. Once the rim is clean, secure the bottom lid. Place the brewer inside the insulated cover. The coffee is finished. No need to add water as this is not a concentrate. You can pour it in a glass or just drink straight from the bottle. 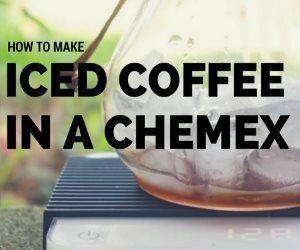 Cold brew coffee doesn’t get much easier than this. With cold brew there are two things that can go wrong. Either the coffee is too strong or too weak. Since this doesn’t brew a concentrate, it is unlikely that it will be too strong. But if it is, the answer is to simply add water to the finished brew. 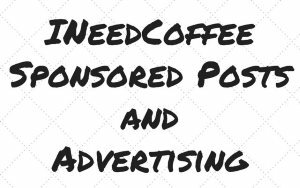 If you discover that the coffee is too weak there are a few strategies you can try. 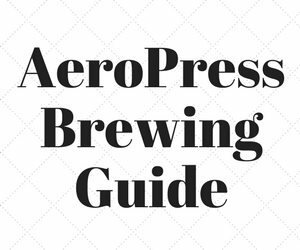 You can extend the brew time, grind a little finer or gently rock the brewer a few times during the brewing process. If you do rock the brewer, make sure you wipe the lid clean before securing the bottom lid. There are a few reviews on Amazon that complain the bottom lid leaks. The first brewer I received for this tutorial did have an occasional leak issue. Usually it was the result of loose grounds getting between the lip of the filter and the bottom lid. 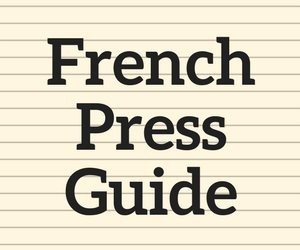 The same thing can happen with the Aeropress. The good news is the filter has been redesigned. It is larger and it solves the leak problem. 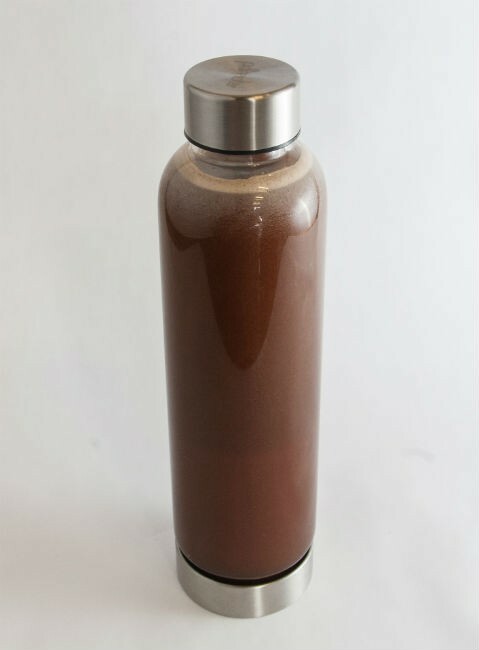 If you are looking for a simple no-mess foolproof cold coffee brewer, give the Primula Brew Travel Bottle a try. Making Cold Brew Coffee With the Primula Coffee Maker – INeedCoffee tutorial for the 1.6 quart cold coffee brewer. Disclosure: INeedCoffee received a Primula brewer to use for this tutorial.